6th December 2018. Peacefully at hospital, late of Ardmore Gardens, Bangor. Dearly loved wife of Fred, much loved mother of Peter and Ian, mother-in-law of Julie and Helena, loving nana of Jack, Hollie, Bodhi and Luca. Service in S Clarke & Son’s Funeral Church, Bangor on Monday at 10.00 a.m. Funeral afterwards to Clandeboye Cemetery. Family flowers only please. 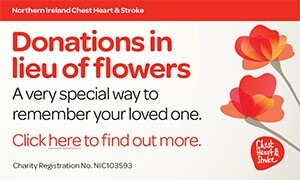 Donations may be sent if desired to Marie Curie or MacMillan Cancer Support, c/o S Clarke & Son, Funeral Directors, 64 Newtownards Road, Bangor, BT20 4DR. Will be sadly missed and lovingly remembered by her husband, sons and all the family circle. I am sorry to tell you that Margaret WILSON has passed away.